A Gaging.com favorite! 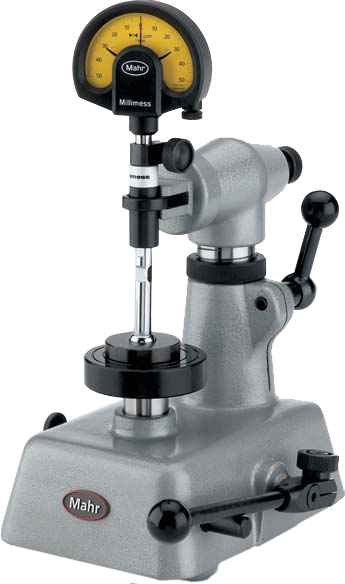 The Mahr Federal 844K Intramess self-centering bore gage is a long established favorite of Quality professionals. Featuring a split ball spherical design, ease of use and repeatability are two of its most appealing features. There are many variations of this gage available with several indicators (see the "Downloads Tab for the product flyer"). Please contact us for pricing and we will help you build your Mahr Federal 844 K Intramess bore gage system! Effective at measuring the ovality and taper of a bore. Constant measuring force to eliminate operator "feel"
4470000 Marameter 844K Mahr Self Centering Bore Gage 0.018 - 0.038 inch / 0.47 - 0.97 metric - Chrom..
4470001 Marameter 844K Mahr Self Centering Bore Gage 0.037 - 0.06 inch / 0.95 - 1.55 metric - Chrome..
4470002 Marameter 844K Mahr Self Centering Bore Gage 0.060 - 0.160 inch / 1.5 - 4.2 metric - Chrome ..
4470003 Marameter 844K Mahr Self Centering Bore Gage 0.145 - 0.29 inch / 3.7 - 7.3 metric - Chrome ..
4470004 Marameter 844K Mahr Self Centering Bore Gage 0.26 - 0.40 inch / 6.7 - 10.3 metric - Chrome ..
4470005 Marameter 844K Mahr Self Centering Bore Gage 0.37 - 0.73 inch / 9.4 - 18.6 metric - Chrome ..
4471002 Marameter 844KH Mahr Self Centering Bore Gage 0.060 - 0.160 inch / 1.5 - 4.2 metric - Carbid..
4471003 Marameter 844KH Mahr Self Centering Bore Gage 0.145 - 0.29 inch / 3.7 - 7.3 metric - Carbide..
4471004 Marameter 844KH Mahr Self Centering Bore Gage 0.26 - 0.40 inch / 6.7 - 10.3 metric - Carbide..
4471005 Marameter 844KH Mahr Self Centering Bore Gage 0.37 - 0.73 inch / 9.4 - 18.6 metric - Carbide..
4482163 Marameter 844KS Mahr Self Centering Bore Gage .060 - .160 inch / 1.5 - 4.2 metric - Chrome/B..
4482164 Marameter 844KS Mahr Self Centering Bore Gage 0.145 - 0.29 inch / 3.7 - 7.3 metric - Chrome..
4482165 Marameter 844KS Mahr Self Centering Bore Gage 0.26 - 0.40 inch / 6.7 - 10.3 metric - Chrome..
4482166 Marameter 844KS Mahr Self Centering Bore Gage 0.37 - 0.73 inch / 9.4 - 18.6 metric - Chrome..